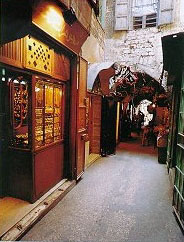 When going from the sea castle towards the Castle of St. Louis, you'll go through Sidon's souk. South of it you'll find the great Mosque. It's an ancient building which in the 13th century had previously been a church: the Church of St. John of the Hospitalers. This church was built by the Crusaders in the shape of a fortress. The building is truly imposing and well worth a visit. Sidon is famous for a variety of local sweets that can be seen being prepared in the shops of the old souk as well as in the newer parts of the shopping area. The particular specialty of Sidon is known as "Sanioura", a very delicious crumbly cake that melts in the mouth.